Is it just me, or has the world gone batshit crazy overnight. Pardon my language y’all but seriously the news these days is just cray cray insane. I don’t even recognize my country anymore. Murder, mayhem, chaos and disorder are the new norm. I don’t watch the news anymore and recently stopped reading the newspaper (on-line version) because I was getting seriously stressed out by all the really bad news. When Courtney was alive my life revolved around her daily care. I didn’t have time or energy to invest in anything but keeping those details straight as well as being a mother to Jonathan and a wife to Jerry. Then she died and I went into a deep, dark hole for six months and slowly crawled my way out of it. I started a new job and began participating in the world again. These days I’m thinking that deep dark hole I was in was pretty darn nice. Mind you, I am no wimp. Strong and sassy is my game but lately I just can’t take it all in. Our world is so injured and there seems to be an abundance of hate and intolerance being broadcast daily to a town near you. Last week my heart broke again with another attack overseas combined with more shootings here at home, added to the current political climate and even closer to home there is strife in the life of friends and family. I scarce can take it in. I felt the familiar pull of hopelessness that I had fought every moment of everyday when my sweet daughter was with me and suffering so with seizure after seizure, day after day. It actually took me by surprise. I thought I was done with that battle. Courtney is in heaven having completed her job here on earth with so much courage and love. What could possibly be as bad as that? Hate plus lack of faith in the One True God. Hate plus the breakdown of the family. I reached a point I just couldn’t take it anymore, so I turned it off and took along deep breath. My first thought was of Our Lady of Fatima and the rosary. When the Blessed Mother appeared to three children in Portugal in 1917, the world was at war and people felt hopeless. There was chaos everywhere you looked. I sort of feel the same way today. Pope Benedict XVI, when he was Cardinal Ratzinger, explains it this way “The Heart open to God, purified by contemplation of God, is stronger than guns and weapons of every kind. The fiat of Mary, the word of her heart, has changed the history of the world, because it brought the Saviour into the world—because, thanks to her Yes, God could become man in our world and remains so for all time. The Evil One has power in this world, as we see and experience continually; he has power because our freedom continually lets itself be led away from God. But since God himself took a human heart and has thus steered human freedom towards what is good, the freedom to choose evil no longer has the last word. From that time forth, the word that prevails is this: “In the world you will have tribulation, but take heart; I have overcome the world” (Jn 16:33). So how does this strong and sassy lady plan to take on the anxiety and uneasiness of living in today’s world? This chick is going seriously old school baby. 1917 old school. It’s time to pound those beads one decade of the time. Our Lady said her Immaculate Heart will triumph and I am her newest daily warrior in that war. No more anxiety or panic. No more useless anger and shouting at the TV. Instead this Mary got peace, hope and decades of love. Let’s get our prayer on shall we? Couldn't agree more, Mary! Need to re-double my efforts at daily rosary, and with a little more devotion to the words as well. I'm joining you! 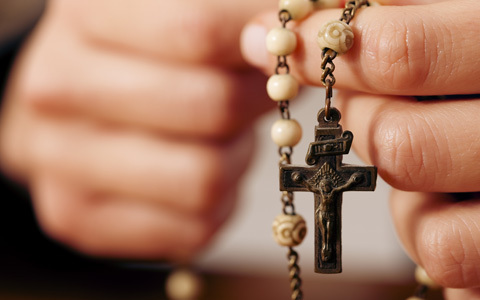 I'll join you…but I'm a horrible Rosary pray-er, so I'm going to start with one decade a day, and move on from there. Definitely joining you! Thanks for the call to arms, Braveheart!!!! I love you! I'm in. Thank you for this inspiration Mary! I've been feeling helpless and hopeless about the state of our current affairs and needed this reminder. God Bless! Amen, Mary! It's all happening as Our Lady of Fatima woefully predicted–All.This.Horribleness. We need to share the message of Fatima, pray the rosary, and make reparations to the Immaculate Heart of Mary! I try to say my Rosary daily whenever I can. You're right there's so much hurt and evil in this world. I join my sorrows to Mary because she understands sorrow. I also pray that Jesus will come back soon because we really need Him. I'm just getting caught up on "life" and am so grateful for your words and wisdom that I was able to soak in tonight. Literally had rosary in hand as I clicked on this post! We met at a far distance at Edel a few years ago. Couldn't agree more on the power of the rosary!! I would love to send you a SoulCore Rosary Workout DVD as a gift of gratitude for sharing your heart and soul with all of us, and as an invitation to enhance your rosary prayer experience, engaging body and soul in prayer. Shoot me an email with where to send. Continuing to keep you in prayer Mary!